The Bio-Information System Laboratory (BISL) in the Department of Bio and Brain Engineering at KAIST is a laboratory dedicated to the education and study of convergence technology based on computer science and biomedicine, with research topics including bioinformatics, health informatics, and data mining as its main focus. BISL is focusing on establishing the required rules of various biomedical phenomena through technical research on bio-data mining and system bioinformatics. KAIST Professor Doheon Lee, who manages BISL, has been actively pursuing the laboratory’s key research ever since becoming the director of the Bio-Synergy Research Center (www.biosynergy.re.kr), a national policy research project run by the government. This project is aimed at the development of original technology involving IT-BT fusion and convergence that can establish the multi-component, multi-target (MCMT) action principles of food and drugs in the human body through a virtual human body system. BISL is currently conducting Collaborative Research for Us (CORUS; corus.kaist.edu) as part of the Challenge Project to verify human body efficacy in the virtual human body system. CORUS is being conducted in the form of citizen science with the voluntary participation of the general public, who provide the information necessary for research and are rewarded in return with cryptocurrency through the blockchain network. For this encrypted reward system, security and transaction integrity must be guaranteed. It was also impossible for the laboratory to provide a platform with user convenience as a priority because of its limited IT manpower compared to the number of citizens participating in the project. Therefore, BISL needed a solution that could be managed by a small number of personnel and which would provide high levels of both security and user convenience. Currently, the CORUS project runs on AWS. The PostgreSQL server, Docker, and other components were all relocated to Amazon Relational Database Service (RDS) and Amazon Elastic Container Service (ECS). For the creation and transfer of cryptocurrencies requiring data safety, transaction integrity was ensured through Amazon Simple Queue Service (SQS), Amazon Simple Notification Service (SNS), and AWS Lambda. Due to its high level of safety and availability, Amazon Simple Storage Service (Amazon S3) is used as a data repository. Meanwhile, Amazon EMR is used for high-volume data analysis. 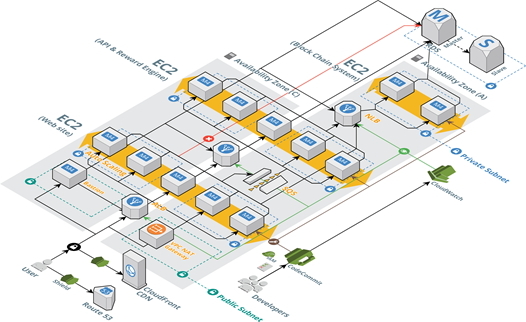 Amazon CloudWatch is used for monitoring the entire system, and Amazon EC2 Auto Scaling for ensuring availability. AWS CodeCommit, AWS CodeDeploy, and AWS CodePipeline are used for developing, storing, and deploying code. The architecture of KAIST is shown in the diagram below. Researcher Junseok Park cites less time-consuming infrastructure management, more stable service operation, and a convenient development environment as some of the advantages of AWS. The researchers wanted a solution that would let them focus on their research instead of spending time on server management and other tasks. “As a developer, I found AWS to be very convenient. In our previous development environment, we had to stop services when we needed to update them. With CodeCommit or similar services on AWS, however, you can update services without stopping them. In addition, CORUS’s data storage blockchain consists of many nodes. With our existing server, you would have to newly configure a server whenever these nodes increased. Because using AWS removed this workload, however, it was very convenient,” he says. He adds that CORUS users are expected to increase, with user responses increasing rapidly as well. “We expect the AWS solution to enable us to deal flexibly with this issue and smoothly elicit a seamless response from users. We are going to configure a platform that lets us collect and analyze tens of thousands or hundreds of thousands of data points simultaneously, and we expect we’ll achieve good results,” he says. For more information, please visit https://aws.amazon.com/.